Selfies are not just a trend anymore like they were a few years back. Now they have become a part of our lives and have their own place in the life of a youth. Not just youths, everyone from all the age groups are running behind the craze of Selfies. All it takes to click a good selfie is a good camera phone. But, if you want to click a selfie that can be considered decent then owning a good one from available best selfie sticks is very necessary. When it comes to taking a group selfie then there is no alternative of selfie sticks. Besides that, it allows you to capture a good shot as it prevents your phone from unnecessary movements and provides the stability that it needs to click a good shot for your Instagram or Facebook stories. Moreover, group selfies are almost impossible unless you have a good selfie stick. When it comes to group selfie, it is true that area gets wider and to capture all in a single shot, it is must to have a selfie stick which can help you out in such situations. We did our research to find the best options available in the market. below you will find the list of best selfie sticks that came out after looking at available best options in the market. Note: The list can be much larger but I have removed all the products which are not worth the price they cost. This is the probably best list you will find. I have also added direct links to Amazon product page where you can purchase them online at the best price. 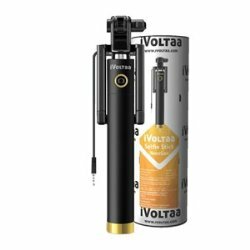 iVoltaa Next Gen Compact Selfie Stick is the best selfie stick under budget that you should consider buying at first. It is the best selling product at Amazon with good ratings from real buyers. You can finder nearly one thousand reviews of this product which will make it clear why you should purchase this product. Moreover, this stick costs very less to our pocket and comes with 6 months doorstep replacement policy which is a major plus point for this selfie stick. Just to be safe we recommend you to purchase this from Amazon or Flipkart only as that will keep you safe from a duplicate product. You can visit the below link to buy this selfie stick at the best price. You will have to connect this with your smartphone using a 3.5 mm headphone jack which is plus point when it comes to a traveler’s need. This selfie stick is compatible with all the smartphones so you can buy this without any problem. Xiaomi selfie stick is a nicely built selfie stick. It is very lightweight (132g) and portable which will be very helpful in carrying. Moreover, it is expandable up to 70 CM which will let you capture a big area at ease. You can simply carry this lightweight selfie stick from MI and can click some really nice selfies. This selfie stick connects through the headphone jack and compatible with all the smartphones running Android 4.2.2 and above. It is also compatible with all iPhones running iOS 5 or later, though it is not compatible with iPhone 7 & iPhone 7 Plus. This selfie stick costs higher then iVoltaa selfie stick but if you have a good budget then you should go for it as it worth the price. You can be sure about its quality as it is from India’s bestselling smartphone brand. With a folded size of 7.5 inch and expandable up to 31 inches, it is one one the best selfie sticks available online. It also has an adjustable clamp which can be rotated up to 270º. It is a wired selfie stick which has similar compatibility like other wired selfie sticks. You can simply connect it with any smartphone using aux cable. However, make sure your smartphone is running on Android 4.2.2 or above so you don’t face any compatibility issues. This selfie stick is available for purchase at a very low price under special offer at Amazon. You can go to the best price by using the below link. This is a Bluetooth selfie stick. 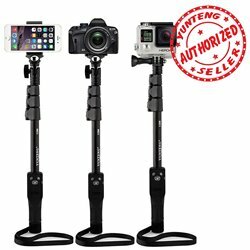 It is capable to handle enough weight which makes it the first choice if you are planning to buy a selfie stick which you can use with GoPro or camera as well. It comes with a separate Bluetooth remote which let you control it easily. The Bluetooth remote works with smartphones only so you will have to use traditional ways to click pictures if you are going to mount your camera on this. As the remote for clicking pictures will be available separately so make sure you don’t lose it. Also, you will need to charge remote timely so it can work without any lags. However, it has a few extra features than other which makes it stand out of crowd. Its remote has Zoom In / Zoom Out buttons which let you optimize your picture’s range remotely. It is a really nice feature. The product seems value for money product as it has got very good ratings on Amazon which can be check by using best buy link below. This is a Bluetooth selfie stick from iVoltaa. It is very nicely built and available at best price at Amazon. This selfie very portable and folds to the size of 12 CM and can be expanded up to 50 cm. It connects through Bluetooth 3.0 and has a good range of 10 meters. It comes with 2032 mAh battery which lasts for over 6 months. Large battery capacity is very important as that will keep you free from charging/replacing the battery again and again. This selfie stick is compatible with all the Bluetooth enabled phones. It supports iOS 5.0 or above, Android 2.3.6 or above which includes most of the smartphones. You can purchase this selfie stick from Amazon at best price use below best buy link. To be honest there are not so many things that you should check before buying a selfie stick for your smartphone. There is not so big technology behind selfie sticks so you can just go ahead and purchase one which is under your budget. But, still, it is very important to look at a few factors before purchasing one as I’m sure that you don’t want to purchase another piece of garbage which has no use for you. You can follow below buying guide which will help you in deciding which selfie stick you should purchase. It can be and can not be the most important thing to check before purchasing a selfie stick. If you own a smartphone which is slightly older then there is a little chance that some of the selfie sticks may not be compatible with your smartphone. So it will be much better if you can go through buyers reviews on the product page which will make it more easy to know whether you are going to purchase something which will work well for your smartphone. Tot all sticks are compatible with all smartphone and operating systems, like some of the cables, might not work with older versions of Android which some of them may face problems with iOS i.e apple smartphones. In case, you have already ordered a defective selfie stick which doesn’t seem to work with your mobile phone then you can make use of timer function of your camera app in which you can set a 5-10 second timer. In meantime, you can set the position of your phone to capture a good selfie. Most probably length is something which makes a selfie stick portable. In my opinion, a good selfie stick should be as smaller as possible when folded which will make it more compact to carry and put in your backpack or maybe in your pocket. On top of that, it is also important to have a good reach once the stick is extended. A good selfie stick should be at least 30-40 centimeter lengthy once extended. A good length will help you to take a wider shot and will be very helpful in taking a good group selfie. 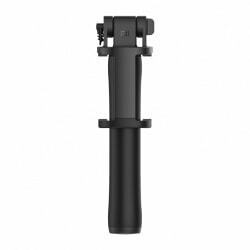 However, when you are purchasing one from the above list of best selfie sticks then you don’t have to worry about all this as we have shortlisted all these as per best standards that we find very necessary in any of selfie stick. The list will make it sure that you are purchasing a product which has a remarkable quality, durability along with ease of handling. Not all smartphones support Bluetooth selfie sticks or some of the selfie sticks are not compatible with some of the smartphones. So it is a very important thing to check before you place an order. Moreover, I have also seen that some smartphones even have compatibility issues with wired selfie sticks as well. As wired sticks work by connecting through headphone jack so in some of the smartphones, a headphone jack is not capable to receive signals to click a picture through camera app. On top of that, there is no 3.5 mm audio jack in new smartphones so make sure you don’t make a mistake of ordering a wired selfie stick for a smartphone which has no smartphone jack. 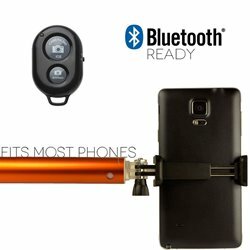 From a point of view, Bluetooth Selfie Sticks seems a good choice as in that you don’t have to connect your smartphone with selfie stick. But, for traveling it is not suitable at all as it is a Bluetooth based selfie stick so you will have to take care of its battery as well which is quite hard while we are traveling. Besides that, if you purchase a cheap quality Bluetooth selfie stick then it will keep lagging which will be a big headache for most of us. Such cheap sticks will not last much and will become a useless piece in a few days. So, if you have a limited budget then you should purchase a wired selfie stick instead of a cheap Bluetooth stick. A well-built quality along with a good rubber handle is must for any selfie stick. A good grip will help you to hold your selfie stick easily. While a nicely built selfie stick will last longer which will let you make the best use of the money you spent on purchasing. A good selfie stick will last longer and will keep you free from lags which you will face in a cheap selfie stick (Especially Bluetooth Selfie Sticks). So I recommend you to purchase one from the above list of best selfie sticks so you don’t have to purchase it again and again. Though this is not the thing which you should consider at last. But as per our experience, we have seen that most of the selfie sticks come with a decent clamp. In general, you should try to get a selfie stick which has a clamp which can mount your smartphone very well. It should be neither so tight nor so loose. A tight clamp can damage your mobile while a loose one will make your phone fall from it while you are clicking a picture. Your best selfie stick should be able to handle all standard size smartphone very decently so you can use with any smartphone that you have regardless of its size. So, guys, that’s all. 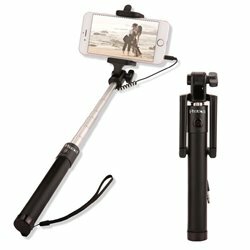 I hope this post might have helped you in getting a decent piece from the list of best selfie sticks. You can comment below if you have any question about the same.